DENVER -- A Denver7 investigation reveals RTD repeatedly denied numerous requests for video from bus and train incidents claiming the incidents were still under investigation by law enforcement when in fact, those investigations had already concluded. State law allows public agencies to deny requests for public records under the Colorado Open Records Act (CORA) if they pertain to active law enforcement investigations. But Denver7 found a handful of cases in which RTD denied requests for video citing ongoing police investigations that had actually already concluded. “I find it disconcerting that a public agency, financed by public funds, and performing a public function, is withholding records for which there isn't any valid exemption under our open records act,” said attorney Steve Zansberg, president of the Colorado Freedom of Information Coalition. Zansberg has represented media agencies in legal cases where TV stations and newspapers have sought public records after being denied. 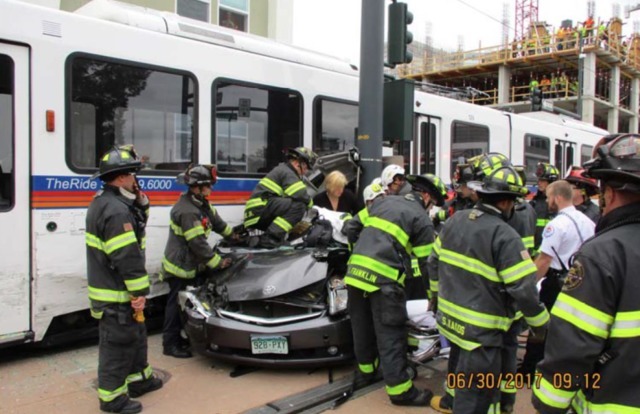 In one RTD case reviewed by Denver7, RTD refused for months to release video to a driver who hoped the footage would prove she wasn't at fault when she had a brush with death in an eye-popping collision with a light rail train on June 30 of last year. “It was one of those things where you're like, ‘I can't believe this is happening to me.’ Then I thought, ‘I'm dead,’” driver Tia Mills told investigative reporter Jace Larson. Weeks after surviving the crash, Mills was surprised to receive a traffic ticket in the mail saying she ran a red light. “I was sure I entered on a yellow light. I had not run a red light,” Mills said. She hired a lawyer, who sent a request to RTD for all of the agency’s video of the incident. RTD rejected the request on Aug. 2, even though Denver Police Department records obtained by Denver7 Investigates show police concluded their investigation on July 22. Mills managed to obtain video from a Denver police overhead security camera, called Halo, to prove the crash was the train driver’s fault in October. At that point, her attorneys submitted another request for RTD’s video. The agency again rejected the request, citing an ongoing investigation that at that point had been closed for months. It wasn’t until Tia’s attorney threatened to take RTD to court that the agency finally coughed up the video. “It simply is not fair. Especially when Tia Mills wants to know the truth,” said Mills’ attorney, Lorraine Parker. Mills is now suing RTD, seeking damages for the cost of her destroyed car. In another case, RTD told a records requestor that a minor crash in which a bus hit the door of a parked car was still under active police investigation 15 months after the crash and denied a request for video. Denver7 found police had closed their investigation within a few days of the incident. An attorney who said his client was hit by a bus and lost his leg had his request for video rejected by RTD. RTD cited an ongoing police investigation. The attorney only received the video after going to the Denver Police Department himself and confirming the investigation was actually closed. A woman taken off a bus after a driver reported to police she did not pay her fare, requested video from inside the bus two months after the incident. RTD said no because it was still under investigation by Denver police, even though officers had closed the case the same day of the incident. 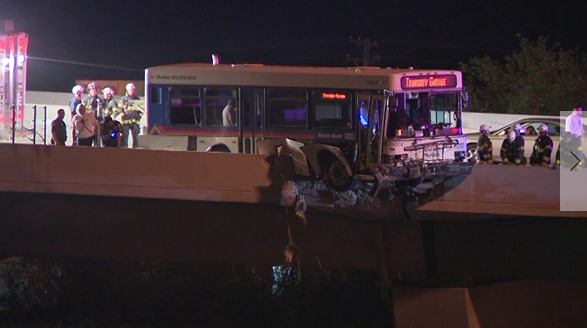 RTD rejected a Denver7 request for video from a bus that nearly crashed off the 6th Avenue overpass a day after records show police closed their investigation. Responding to Denver7’s findings, RTD spokesperson Scott Reed said he believed the agency’s records staff received the wrong information in phone calls with police in some of these examples. "We never denied somebody's request for information based on something we knew to be false," Reed said. Reed argued that people who have their records requests rejected can always reach out to law enforcement on their own to determine if the police case is open or closed. Zansberg said it’s not the public’s responsibility to prove to RTD whether its own records are releasable or not. “If [RTD] is going to withhold records based on an ongoing investigation, then it bears the duty to prove that that investigation is in fact ongoing,” Zansberg said. “The burden of proof, and that investigation to determine whether there is an ongoing investigation, is squarely and solely upon a records custodian. Not upon a citizen." Reed did say RTD would explore ways to improve its process. "I think there are areas for improvement by RTD. We may also want to talk to the law enforcement jurisdictions and see if there's something we should do differently when we request information from them," Reed said. The Contact7 Investigates team looks into the issues that affect Coloradans and gets results by holding individuals accountable.